Amazon's recent decision to purge some book reviews by friends, family and other suspicious characters comes on the heels of reports of an entire industry of paid reviewers as well as the practice of authors ganging up to review each other's books -- favorably, of course. Beyond a "kerfuffle" over the reviews themselves lies the seedy world of bullying in book-review forums and other phenomena all too common in the protected anonymity of the Internet. You also have to wonder how Amazon knows that Review A was written by a stranger but Review B by a family friend. That's a little scary. The whole sordid business has some urging readers to ignore good reviews as presumed fakes and concentrate on the middling ones. This puts writers in an awkward position, particularly when you're self-published. On the one hand, you want good reviews because they may be the only thing that prompts a customer to buy your book. But if readers start thinking all your good reviews are fakes you've solicited -- or worse, paid for -- they'll take their resentment at your trying to fool them, and their business, elsewhere. 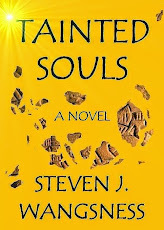 I periodically check for new reviews/ratings of my novel Tainted Souls. Since readers can download it for free, nice reviews are pretty much the only validation I get for the effort I made writing it and inspiration to write another book. So it's been nice to rack up a few new four- and five-star reviews in the past few weeks. (For some reason, Barnes & Noble and Goodreads are more active; Amazon has relatively few reviews.) But I appreciate, I guess, that a couple of clunker reviews have rolled in, too, to provide some validation to the positive ones. I suppose it's only a matter of time before some enterprising person comes up with an app that generates the perfect combination of high, middling and low-ranking fake reviews to generate maximum book sales. Wonder what Amazon will do then. Would you believe this story if pitched to you as a novel? Your protagonist is born in poverty, ninth of ten children, to a disabled war vet and an Irish immigrant mom. Five of his sisters die in childhood of scarlet fever or smallpox and his dad dies when he is 16. He lands in the first wave at Omaha Beach, where his unit is cut to pieces, but despite machine-gun and shrapnel wounds he kills eight Germans before the day is out. Later, having recovered from his wounds, he engages in hand-to-hand combat and is stabbed eight times by a bayonet, but he manages to overcome his opponent by bludgeoning him to death with a rock. When he sees that the Nazi soldier he's killed is only 15 or so, he cradles him in his arms and cries. Later, having recovered from his latest wounds, he is captured during the Battle of the Bulge and is one of only a handful of men to escape the infamous SS massacre of U.S. troops at Malmedy. Finally, a "million-dollar" wound sends him home. He battles post-war trauma for the rest of his life and struggles with menial jobs for more than a decade while pursuing a career as an actor. He's nearly 40 years old when he first tastes success but then rises to the top of his field. Such was the life of veteran character actor Charles Durning, who died on Christmas Eve at 89, perhaps best known for his roles as the crooked cop in The Sting and Jessica Lange's clueless father, besotted with Dustin Hoffman's "Tootsie." I read a lot of nonfiction accounts of World War II. Not the grand strategy nor how big battles played out, but the stories of individual soldiers and civilians caught up in the crazy maelstrom of those years. They have literally millions of stories to tell of the highest possible drama. Their lives are a reminder to me first, that while I sometimes may feel sorry for myself and all my woes, really I've had it pretty good: I've never known want, had loving parents who put me through college, never had to hit the beach and face machine guns, mortars and artillery raining death and destruction around me. Their lives, like Durning's, are reminders, too, of how many tales there are to be told of the human experience. Truth may be stranger than fiction, but sometimes fiction is the best way to tell it. I suppose that's why some of us try to write it.